See how Harvey Nichols increased sales and improved the customer experience online. Cart abandonment is a huge issue for all online retailers, with research highlighting that more than 76% of shoppers leave websites without completing the purchase. Companies like Harvey Nichols attract thousands of online visitors every day, so this means a massive amount of potential revenue is left on the table. Harvey Nichols identified this challenge and approached SaleCycle to create an intelligent Email Remarketing program to help convert more of their web visitors into customers. 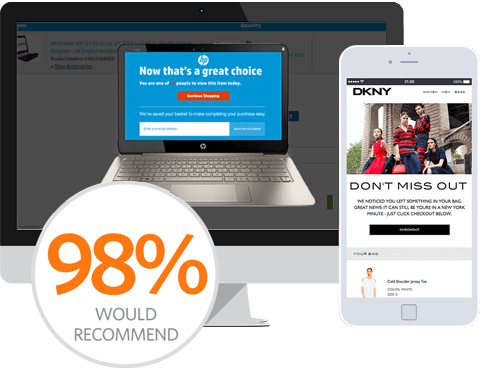 Harvey Nichols partnered with SaleCycle to develop and create an intelligent multi-cycle remarketing campaign. From catwalk to cart, Harvey Nichols provide the ultimate luxury fashion experience online. Using SaleCycle’s clever email remarketing, Harvey Nichols are able to distribute remarketing emails to customers who’ve abandoned a purchase online – tempting them back to complete the purchase. Customers not tempted by the 1st and 2nd cycle emails are then sent a 3rd email which asks them to get in touch to discuss any problems with the order. This helps to solve any issues customers may have and identify reasons for abandonment. SaleCycle’s partnership with Harvey Nichols has been a real success. Not only has it increased online revenues, it’s also helped to improve the online customer experience. The multi-cycle email campaigns from Harvey Nichols have been highly effective, driving a significant increase to overall online sales. The remarketing campaign boasts an email open rate of more than 41%, resulting in an impressive conversion from click rate of 19%. The importance of a multi-cycle email campaign has been highlighted by Harvey Nichols, with an outstanding average order value of around £217 per email sent. I’ve had a really great experience with SaleCycle. Quick turnaround, helpful account managers who are always on call to answer any questions, great reporting dashboard and customer reports!